Three canola varieties from Pacific Seeds planted by a couple on their property near Shepparton have yielded great results, leading to good cash flow at harvest time. Craig and Helen Reynolds took the advice of their agronomist and seed supplier by planting two Clearfield varieties and a Triazine Tolerant variety last winter on 230 hectares covering 30% of their property at Congupna. The husband and wife team run an irrigated summer and winter crop operation. Mr Reynolds explains that canola is a good break crop, offering good herbicide packages and good cash flow at harvest time. 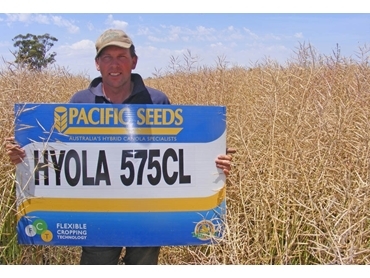 The three Canola varieties from Pacific Seeds included Hyola 575CL, Hyola 474CL and Jackpot TT. Apart from the good yield and oil return, the growers were impressed with its standability. All three varieties averaged three tonnes per hectare yield with about 44% oil, while Jackpot went a bit further at 3.5t/ha and 46% oil. Planting was put off until the end of April because the Reynolds’ had to wait for the land to dry out from the floods that affected the region at the start of March. To provide the plants with adequate nutrients, the growers combined chicken manure with 200kg of single super phosphate and two 100kg applications of nitrogen. A 25cm disc seeder was tasked with the job of planting the seed, which went into the wheat stubble-covered clay loam soil along with 80kg of MAP phosphorus. The need for irrigation was minimal due to favourable conditions during the season. The crop was first irrigated in September and then again in early October, and was supported additionally by perfect growing conditions. According to Mr Reynolds, getting the plant height right is very important to farm efficiency, especially for hassle-free harvest. Abundant marketing opportunities are also available when it’s time to sell the harvested canola at the end of the year. The Reynolds are growing Pacific Seeds canola again this season and hope the harvest is just as easy as last winter.